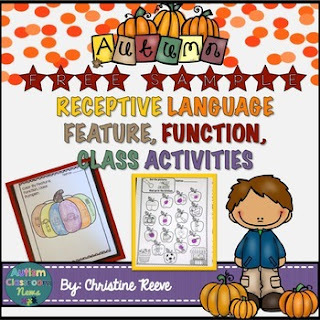 Using a fall theme with apples and pumpkins, this combination of print-and-go and reusable materials is great for early learners, ABA programs, discrete trials and speech therapy. They are designed to provide a variety of ways for special education students and early learners to practice receptive vocabulary skills beyond just naming items. I developed them with the idea of using them with students in discrete trials to be able to administer trials to more than one student and to add some variety to the materials for teaching these skills to prevent students from getting bored. They are designed to help students working on identifying items by feature (characteristics/adjectives), function, and class (category). Please see the product for a cross listing of the paid product materials with specific items from common curricula / assessments including the STAR: Strategies for Teaching Based on Autism Research; the ABLLS-R: Assessment of Basic Language and Learning-Revised; the VB-MAPP: Verbal Behavior-Milestones Assessment and Placement Planning; and the PEAK: Promoting the Emergence of Advance Knowledge. This set of materials can be used in multiple ways depending on how they are constructed. QR Code Receptive Vocabulary Task Cards for Autism: Basic Vocabulary. If you have any questions or concerns about this product or things you would like to see changed, please contact me at my email in the product or in the preview and I’ll be happy to discuss it. This product is copyrighted to Christine Reeve 2015 for use in one classroom. They may not be copied for additional classes without purchasing extra licenses. For bulk discounts, please email me at drchrisreeve@gmail.com.